KCK police captain dies in shooting – Welcome to Wyandotte Daily! Capt. 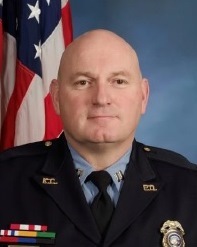 Robert D. Melton, 46, of the Kansas City, Kan., Police Department died Tuesday after being shot, University of Kansas Hospital officials announced at 4 p.m. Tuesday. Trauma surgeon Dr. James Howard made the announcement. 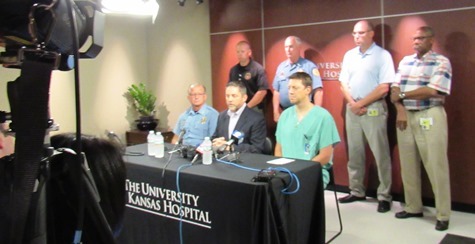 In a news conference at the hospital, Mayor Mark Holland asked the community for prayers. Police Chief Terry Zeigler said around 2 p.m. Tuesday, there was a drive-by shooting. The suspect vehicle left, and there was a vehicle chase. As Capt. Melton was arriving, suspects bailed out of a car near 22nd and Haskell and fired, fatally wounding him, according to Chief Zeigler. He said as the investigation continues, police may find out more of the facts about the case. He said everyone should not jump to conclusions about what happened today, and the police need to make a thorough investigation and get the facts. “My encouragement is we not go down a path of fear and conclusion and hatred, but we go down a path of thoughtful prayerful reflection on what we can do to make our community safer,” he said. Capt. Melton served 17 years with the Kansas City, Kan., Police Department, according to a spokesman. A police spokesman said Capt. Melton died around 2:55 p.m. at the hospital. The disturbance began with a call to police around 1:33 p.m. at 2nd Street and Edgerton Drive, according to the police spokesman. A large police presence was investigating in the area of Klamm Park, near 22nd and Haskell, north of Parallel Parkway. Police earlier said they took one person into custody and were seeking two others. Officials said the investigation was still ongoing, and anyone with information is asked to call the TIPS hotline at 816-474-TIPS. Kansas City Kansas Community College extended its heartfelt condolences to the family of Capt. Robert David Melton, a KCKCC alumnus, and the Kansas City, Kan., Police Department. Melton received an associate of general studies in corrections from KCKCC in 2000. He has worked with the Kansas City, Kansas Police Department since late 1999 and previously worked as a deputy at the Wyandotte County Sheriff’s Office. He was also a member of the Kansas National Guard.